Dr. Tatyana Irinina, joined our team in 2004 as a staff physical therapist and now serves as the medical director of Staten Island Center for Alternative Therapies. Before immigrating to the United States, she worked as a surgical nurse in Russia. In the United States she continued to advance her medical career by achieving her Doctoral Degree in Physical therapy from Long Island University. When Tatyana was in school she made the Dean’s List and was awarded several scholarships for her outstanding achievements. She started her career as a physical therapist at the Aqua Rehabilitation Center in Brooklyn. It was there that Tatyana mastered her clinical skills as an outpatient specialist. 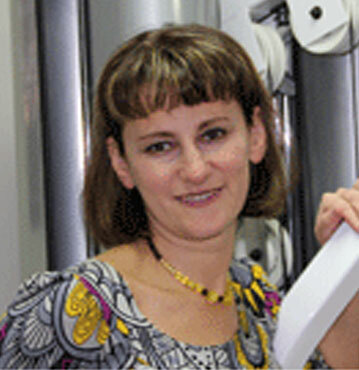 Dr. Tatyana Irinina is well known for her patience and devotion to her patients. Her previous experience as a nurse gives her unique perspectives when rehabilitating patients after various surgical procedures. Furthermore Dr. Irinina has studied the techniques of trigger point release and the Mulligan method to further deepen her already varied orthopedic rehabilitation techniques. Tatyana is also certified as an early intervention pediatric therapist. She is well known as a specialist in treatment of congenital (inborn) torticollis in infants. Dr. Irinina’s outstanding achievement in this area is recognized by both her medical peers and the community at large. In fact, she was asked to participate in a TV show devoted to the treatment of torticollis. Dr. Tatyana Irinina is trying to integrate three basic components of physical therapy – modalities, manual work and therapeutic exercise into her approach of treatment of various musculoskeletal and neurological disorders. Her warm personality, open mind and professional skills have created a loyal following amongst her patients.